Get your playlists ready, your bank accounts in order and your love for music shifted into overdrive, because Mishkin Fitzgerald’s debut album ‘Present Company’ is set to hit the shelves, physically and electronically, Wednesday the 1st of May. After giving her fans a small taste of what is to come through her single ‘I Want This’, Mishkin has truly created and delivered an absolute Masterpiece! By hook or by crook no matter how unique each track was from the one before, ‘Present Company’ fit flawlessly together to form a complete story…a true insight to the talent of Mishkin Fitzgerald. Listening to ‘Present Company’ it was clear that Mishkin exploited her perfected ability to mould diverse tracks ranging from rock to alt-pop to piano melodies to vocal dominance into one, single album. Singles such as ‘My Body, A Bridge’ which purely focused and exhibited her vocal aptitude supported by a very simple instrumental arrangement merely complemented those which stuck true to a heavier alternative, alt-pop rock genre-esque feel like ‘Raise The Bar’ or ‘Sugarknife’. Every song took you on a different journey that constantly kept you on your toes waiting to see what Mishkin had in store for you next. What I truly loved from this album though, was Mishkin’s decision to place her single ‘Present Company (Album title) as her opening track. Why? Because with this single flaunting a hauntingly eerie vocal presence, a chilling piano melody and the sudden backdrop of intense musical instruments three-quarters in, the song immediately drew you in and refused to let you go until you’d heard the entire album...and I wasn’t complaining! Despite how distinctive these 8 songs were separately, the overall demonstration of a dark, vulnerable yet seductive concept allows the album to flow with an ease of range that cannot be over-looked. ‘Present Company’ is a definite must for anyone who wants to know what true musical ability sounds like! 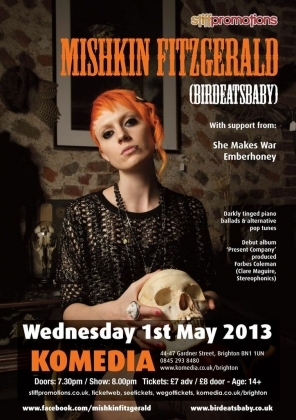 So be sure to get your wallets out and your ears ready as the album launches on the 1st of May at Brighton Komedia with fellow femme fatales, She Makes War, Apples & Eve and Emberhoney.